Andre-Michel Guerry (1802-1866) was one of the inventors of modern social science and the empirical study of social statistics -- rates of crimes, suicides, out-of-wedlock births, etc. 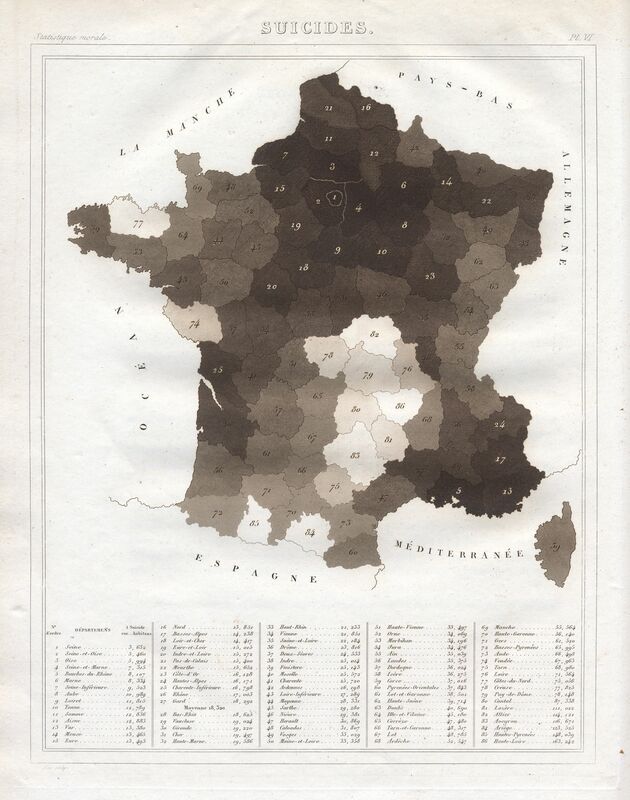 This choropleth map (1864) shows the distribution of suicides in the departments of France over a 25 year period; darker tints portray more suicides. A series of small graphs are used to show other aspects of the distribution -- by day of the week, month of the year, and small symbols on the map show minimum and maximum among men, young persons, etc. la Statistique Morale de la France. See my article, A.-M. Guerry's Moral Statistics of France: Challenges for Multivariable Spatial Analysis, Statistical Science, 2007, 22, 368-399.